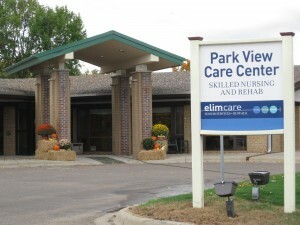 For individuals whose health and physical needs can no longer be met at home, Park View Care Center offers quality 24-hour nursing care. Our innovative programs and services focus on the holistic health of our residents and are always administered by highly qualified staff in a compassionate, resident-centered manner. Therapy and nursing staff members work closely together to develop and execute individualized, incremental rehabilitation care plans that encourage residents to rehabilitate quickly, thus allowing them to regain strength and return to their normal routines as soon as possible. Short-term rehabilitation options are available at Park View Care Center for individuals recovering from surgery or other health issues that allow them to return to an independent living situation. Within the skilled nursing facility, residents facing the trials of Alzheimer’s disease, dementia and related disorders can be actively attended to in our safe and secure 30 bed memory care area. The compassionate staff members in the memory care area are specially trained to care for those with memory loss and adapt activities to meet each individual’s capabilities while still providing them with meaningful social interactions. In order to provide for the needs of our terminally ill patients and their families, Park View Care Center works with hospice providers throughout the community. Through these partnerships, patients and families can receive the additional support, care and comfort they need while working directly with staff who are trained in pain management and comfort care needs. Our specialized rehabilitation program offers residents physical, occupational and speech rehabilitation therapies. Through these services, residents work to regain confidence in their physical strength, fine motor functions and speech abilities. 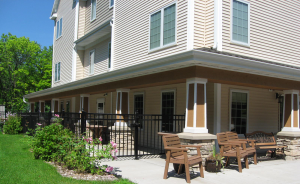 Nestled along the shores of Buffalo Lake, Park Terrace Assisted Living and Memory Care provides wonderful senior apartments for adults who are seeking to retain their independence but may also need some help with daily living activities. 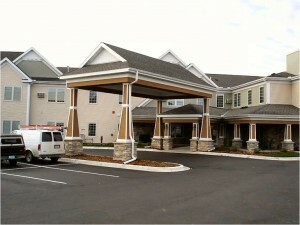 Park Terrace is a wonderful addition to the continuum of care at Park View Care Center. Opened in 2007, this beautiful, modern campus radiates warmth and friendliness, making it easy for residents to instantly feel at home. Park Terrace offers a wide variety of amenities and services, ensuring that our residents receive the physical, emotional and spiritual care they need from loving staff members. 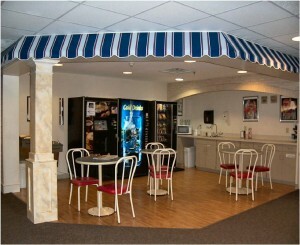 To learn more about Park Terrace, click here. Located on the Park View campus, the Buffalo Adult Day Center offers a number of services to adults who cannot safely stay alone. Through the activities, outings and peer interaction opportunities offered by the Buffalo Adult Day Center, our participants, caregivers and families thrive in our safe, nurturing environment. Additionally, our services provide caregivers who are in need of respite the assurance that their loved one is well cared for while they are away. All staff members at the Buffalo Adult Day Center have received specific training in working in adult day care services and with individuals facing memory loss issues such as Alzheimer’s. 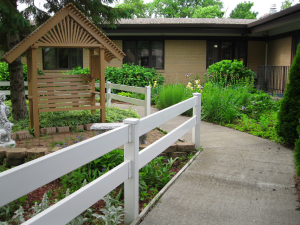 To learn more about the Buffalo Adult Day Center, click here.